St James' Square was created on the initiative of Henry Jerman, the first earl of St. Albans, in the 1660s. The land was initially leased from the Crown in 1662, but Jermyn managed to convince Charles II to give him most of the land as a gift in 1665. The king was presumably attracted to the idea of a new aristocratic quarter in close vicinity to St James' Palace. Jermyn proposed a square with large mansions, about 13 or 14 in total, and the gift was given on the basis that aristocrats would not build substantial houses on land subject to a sub-lease arrangement. The layout of plots had changed considerably by the time the square began to take shape in the 1670s. The idea of large mansions had been abandoned, and what was built in the end were terrace houses on a total of 22 plots of varying sizes. With a few exceptions, the houses were uniform in height and design. The facades were in red brick, with windows capped by a simple combination of stone architrave and cornice. Roofs were steeply pitched with pedimented dormers. Simplicity of style may have been due to current taste. The gift of 1665 demanded that the design of the buildings should be subject to royal approval, and they were presumably accepted by the Surveyor General of Works, John Denham. It may even have been his design. The earliest plots were sold to nobles, but later buyers also included speculative builders who built houses for letting or re-leasing. 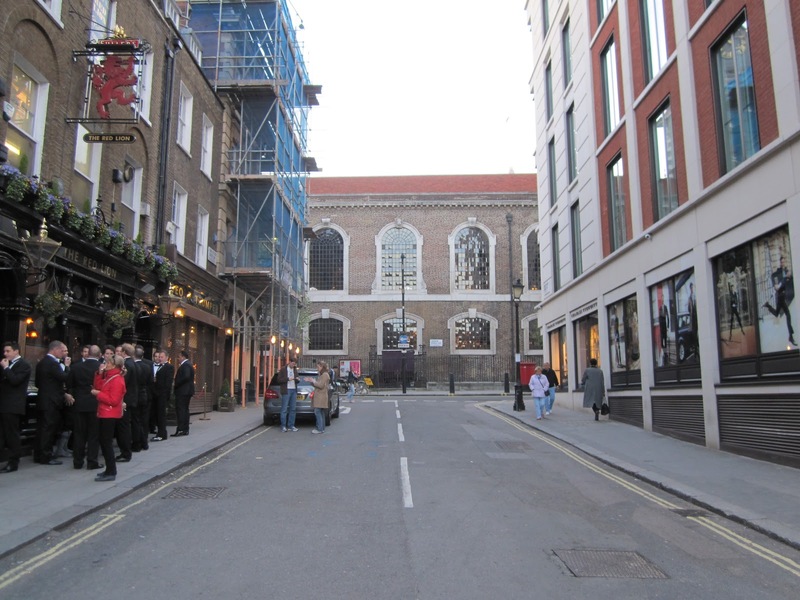 As part of the scheme, Jermyn also created a market and provided a site for a church. The market was created to the east of the square on a site which was subsequently left out of the 1665 agreement and which Jermyn still had to lease from the Crown. The site was later cleared for the construction of Regent Street and Waterloo Place in 1816. The church was designed by Christopher Wren and built to the north of the square in 1676-84. None of the original houses remain, but there are several new builds from the 18th-century. Since most of the plots were freeholds, the uniform appearance was soon lost as new owners replaced the old houses in current styles. The house directly opposite is St. James' Square 13. The current building is presumed to be the work of Matthew Brettingham, working in about 1735-37. Unlike the original house from 1676, the ground storey is dressed in rusticated stone. The two upper stories are in brick but the surface is treated and the brickwork pattern painted on. Windows and parapet have undergone some later alterations and the chimney-stack is also a later addition. To the right is the stucco-facade of St. James' Square 12. The architect was probably Thomas Cubitt and the current house was built in 1836. The work was undertaken on the behalf of Baron William King who took over the original house in 1833. He married the daughter of poet Lord Byron in 1835, and there is a blue plaque to show that she lived there. The original house was built in 1674 on behalf of Cyril Wyche. The facade seems unaltered in a view of the square dated 1752 but appears stuccoed in 1812. There is no record of a new-build prior to 1836. Number 11 has a stuccoed facade by Robert Adam from around 1775, but the house was originally built in plain brick, with a design identical to numbers 10 and 9. The builder of all three was Benjamin Timbrell, with assistance from architect Henry Flitcroft, in 1736. A window on the east front of number 9 (facing Duke of York Street) was added by Hesketh and Stokes in 1906.The ground storey of number 11 was altered by Trollope and Sons in 1877. The original house, covering all three plots with a total of eleven window bays, was the largest in the square and the property of Henry Jermyn from 1676 to 1682. 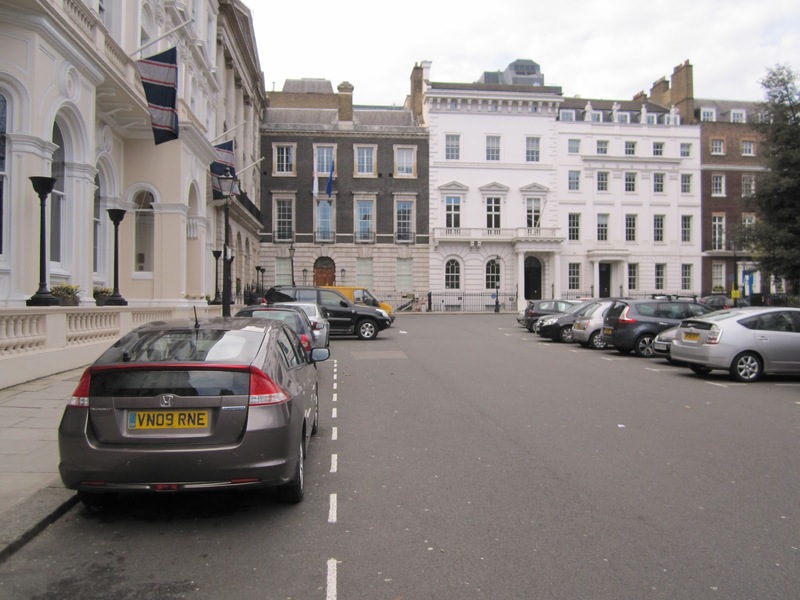 The corner building (St James' Square 14) is one of the narrowest in the square, with a frontage of only 27 feet. The present house was built for the London Library and was designed by J. Osborne Smith in 1896–8. A previous design by Robert Adam from 1776 was never carried out and the house stood substantially as originally built in 1676. The facade is in Portland stone and appears to be influenced by Elizabethan architecture, with its mullioned windows. Number 15, also in Portland stone, is decorated with an ionic portico and was designed by James Stuart in 1764-6 on behalf of Thomas Anson. The balcony was added by Samuel Wyatt in 1791. The previous house from 1676 was demolished in the summer of 1763, and the new house by Stuart was the first stone facade in the whole square. 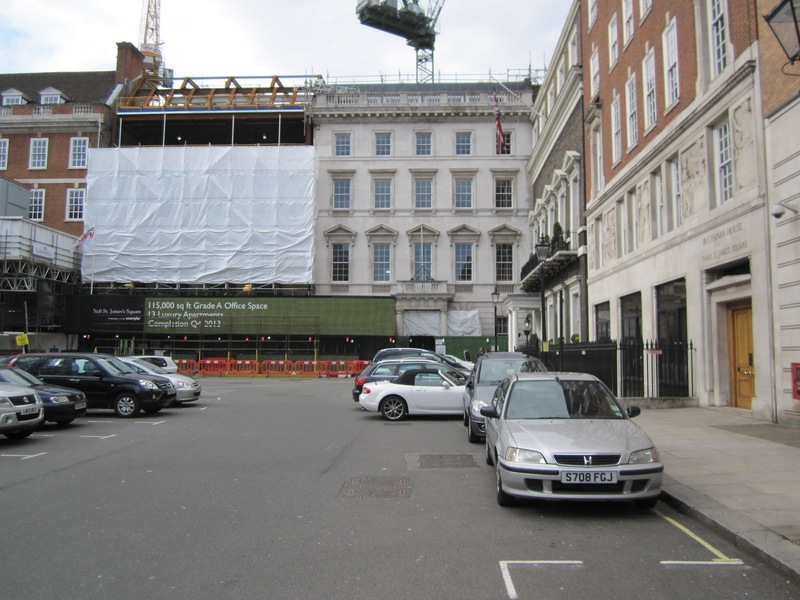 The stuccoed front to the left is St. James' Square 16-17, built for the East India and Club in 1865. The architect for rebuilding was Charles Lee working on behalf of George Myers and Sons. Number 16 was originally built by John Angier in 1676, but was demolished by Thomas Anson in 1789. Anson sold the empty plot in 1804 and a new house was built in 1807. The East India Club bought the freehold of the site in 1861-2. In 1863, they also bought number 17 and joined the two properties together. The site of number 17 was originally part of Halifax House, which also included the present site of number 18. The house was built for George Savile, the first Marquess of Halifax, and was one of the larger houses, with an eighty-foot frontage to the square. It was demolished by the carpenter Thomas Phillips in 1725-26 and replaced with two separate houses. 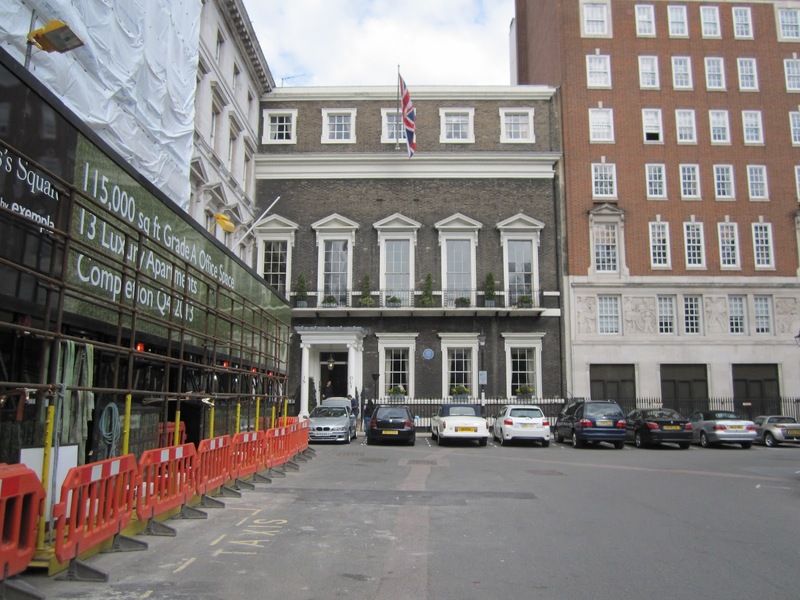 Number 17 was incorporated into the rebuild for the East India Club, while number 18, on the corner to King Street, was give a new classical facade in painted cement in 1846. This was done on behalf of the owner, Sir John Beckett, and the work was carried out by builders Elger and Kelk to a design by John Johnson. On the opposite corner of King Street stands St. James's Square 19 (first right). This site was redeveloped for Harwood International in 1999-2000. The original house was built by Richard Frith in 1677 on behalf of the Earl of Essex. It was demolished as late as 1894, but the facade had already been refaced, a parapet added to conceal the roof and the King Street front may have been rebuilt entirely. It is supposed that this work was carried out in the late 18th century. After 1894, the site stood empty until it was bought by Cleveland House Ltd in 1897. A new office building was built to a design by Rolfe and Matthews in 1898-99. It was initially used as departments for the War Office but was converted to residential use after 1909. The building was replaced with a new office building in 1966. 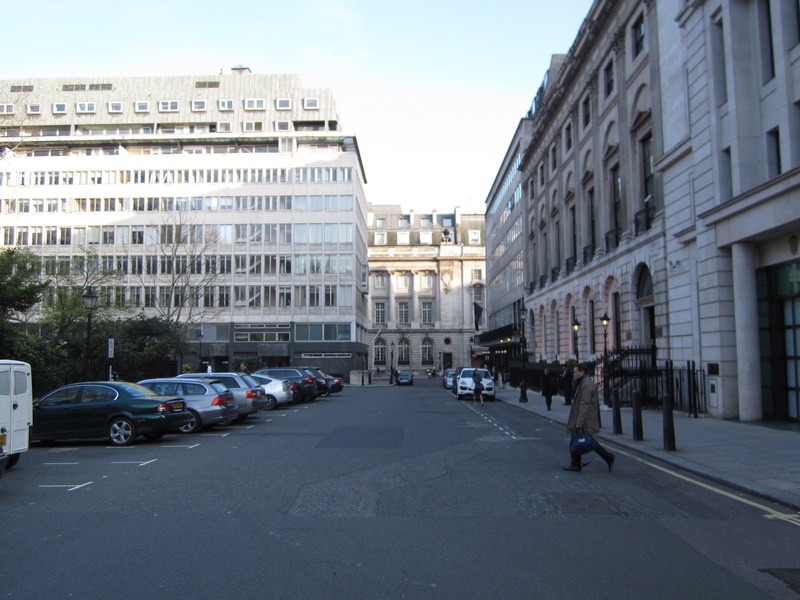 St. James's Square 20-21 was made into a single property in 1936 by architects Mewès and Davis. In doing so, they extended the pilastered facade of number 20, a design by Robert Adam from 1771-5. Number 20 was originally built by Abraham Storey in 1675. It was demolished by Sir Watkin Williams Wynn in 1771. Initially, Winn employed James Gandon to make plans for a new house on the site, but the job was later given to Robert Adam. The new facade had about the same proportions as Stuart's earlier facade at number 15 (three bays wide) and was also in Portland stone. Number 21 was originally built in 1675 but rebuilt in 1790-93. The work was carried out by Robert Furze Brettingham but the owner of the house, the Duke of Leeds, was dissatisfied and employed John Soane to make alterations. Soane made plans for a completely new house, but ended up only modifying Brettingham's work. The work was completed in 1796. The front of this house was built in 'white' bricks dressed with stone. It was demolished in 1933-34 on behalf of the National Sporting Club, but plans for a new building by Mewès and Davis were not carried out. Instead, the empty plot was sold to the Distillers Company in 1935, and in the following year the company also acquired number 20. Two alternative schemes for rebuilding were presented by Mewès and Davis: one giving separate facades to the two adjacent sites or an extension of number 20. The London County Council consented to the second alternative in July 1936. In addition, a mansard roof was added. The next building is Pall Mall 36-39. The northernmost part of the this plot, however, used to be occupied by a house, which would have been St James's Square 22. Before its demolition in 1847, the house was one of the best preserved in the whole square. William Chambers had worked on the house in 1771 but advised against the owner's wish to conceal the brick front. The house was nonetheless stuccoed by the autumn of 1799. It was sold to the Army and Navy Club in 1846 and was demolished the following year. The Army and Navy Club building was built to a design in Venetian style by C.O Parnell and Alfred Smith in 1848-50. The Caen stone decayed and had to be replaced with Portland stone in 1886. The building was replaced with a modern building in the 1950s. As such, it is similar to the building across the street (left). This was the site of the Junior Carlton Club (30 Pall Mall). It was replaced with a new club building in 1968 and is today used as an office building as the club was disbanded in 1977. The southern side of St. James's Square has always had addresses to Pall Mall, and the original houses didn't face the square and were not part of the overall composition. 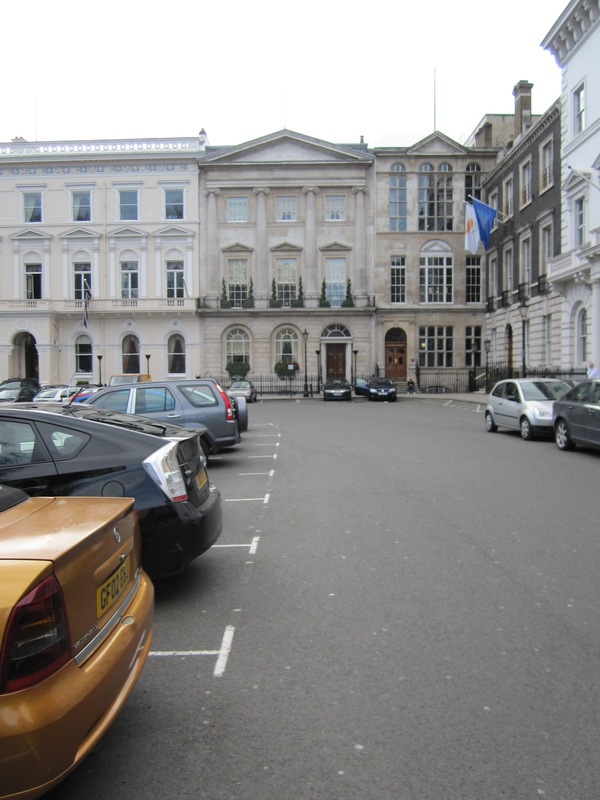 St. James' Square 33, on the corner of Charles II Street, is a design by Robert Adam from 1770–2, following the demolition of the original house from circa 1673. Alterations were carried out by John Soane in 1817-23, but mostly on the interior and the front facing Charles II Street. The Adam facade is a simple affair with flat arches of gauged brickwork over the windows while the cornice was surmounted by a plain parapet. An extra storey was added in the 19th-century and the cornice replaced. In 1910, the house was sold to the the English and Scottish Law Life Assurance Association. The ground storey was refronted in stone with porticos and a garret storey was added in 1911 by architects Edmeston and Gabriel. A cast-iron veranda added in the 19th century was removed and a stone balcony put in its place. The yellow brick building, St. James's Square 32, was built in 1819-21 by Samuel Pepys Cockerell and his son Charles Robert Cockerell. The original house appear in the ratebooks in 1673, with a chimneystack running up the facade between it and the corner building at number 33. It was surveyed by Robert Mylne in 1770 and the house was repaired and refronted, and sold to the Bishop of London, Richard Terrick. Despite Samuel Pepys Cockerell's advice to repair the house, the bishop decided to rebuild in 1819. The front is pretty much as Cockerell designed it. The porch was added in 1931 by H. L. Anderson. The previous entrance was flanked by doric pilasters supporting a lintel. The cornice was originally surmounted by a plain blocking-course, of which two sections have been removed, probably in 1897. The dormer windows were also altered in 1897. St. James's Square 31 was built by architects Gunton and Gunton in 1939. It replaced a previous building known as Norfolk House from 1748-52. However, there were originally two separate houses built on this plot. The southernmost of the two was the first house in the whole square and was built for Henry Jerman in 1667. The earl later moved to St James's Square 9-11. The other house had a more narrow frontage and was built for John Belasyse in 1674, after the plans for the square had been altered to include smaller plots. The dukes of Norfolk acquired the original St. Albans House in 1722 and the Belasyse House in 1748. The original houses were subsequently demolished and replaced with a long front of 107 feet, built by Matthew Brettingham. The facade was in 'white' bricks, dressed with stone. The Dukes of Norfolk finally sold the house in 1937 to Rudolph Palumbo and P. M. Rossdale, who together formed the company Norfolk House (St. James's Square), Ltd. Plans for rebuilding were submitted by architects Gunton and Gunton but the request to builder taller than eighty feet were rejected. The revised application was approved in 1939. The music-room of Norfolk House was subsequently re-erected in the Victoria and Albert Museum. The protruding brown brick building is St. James Square 31A, which was built by an unknown builder in about 1772. Fourth and fifth storeys were added at later date (after 1850) and the doorway was inserted by Brian O'Rorke in 1936. St James' Square 5, was refronted in Portland stone in 1854, but the house is originally from 1748-49 and was built by Matthew Brettingham for the earl of Stafford. The stone facade was designed by Thomas Cubitt and the rebuilding also included an extra story and the addition of a porch on the ground floor. The original house at this site was probably built around 1676 and narrowly escaped the fire at number 4 in 1725. The red-brick facade on the edge to the left is from 1911 and was designed by Edwin Lutyens. The original house at number 7 was built by John Angier with assistance from Abraham Storey. It was subsequently sold to Richard Jones, Viscount of Ranelagh. The house was refronted with a plain brick facade, probably around 1783, and an iron veranda was added to the front in 1857. In 1909 it was bought by three brothers surnamed Farrer, and Lutyens rebuilt the house as their joint residence. The front was faced with red brick and a top storey was added. The house was requisitioned by the Government in 1943 and was used for as offices for the minister of Labour. To the left of that building, on the corner of Duke of York Street, stands number 8, built in 1939 by architects Robert Angell and Curtis. The previous building was given a stucco facade in 1877-79. A proposal for rebuilding was submitted by the sports club in 1937, but the house was subsequently sold to G. E. Wallis and Sons, and new plans for rebuilding were submitted. The London County Council rejected the proposal to build higher than 80 feet and a revised application was submitted in 1939. A chapel previously stood at the back of the site with a front to Duke of York Street. As with number 7, the building was previously used by the Ministry of Labour. St James's Square 4 was built on behalf of the Duke of Kent in 1726-8. The architect was Edward Shephard. The previous house had burnt down in 1725, and was originally built for Nicholas Barbon. An attic storey seems to have been added about 10 years before the house was destroyed. The house has gone through some 19th century alterations but is substantially as Shephard built it. Nancy Astor live there in 1912-42 and the house is now used by the The Naval and Military Club. It is the only address in the square to keep its garden and mews building at the back of the house. The balconies were added later. The tall building in red brick on the right (St James's Square 3) is an office building by architects A. and D. Ospalek, constructed in 1933-34. The original house was built in 1675 on behalf of Edward Shaw but suffered partial collapse and was rebuilt after 1710. The architect of the new house is not known for certain but Nicholas Hawksmoor was involved and may have been chiefly responsible. Substantial rebuilding was carried out by John Soane in 1818-19. The first application to construct a modern office building came in 1929, but the site was left vacant until a new application was approved in 1933. The building is 20 feet taller than the limit imposed by the London Building Act of 1930 but was approved partly because the building faced an open space. Appeals from neighbours against the height were subsequently withdrawn. The stone panels represent London street-criers and were carved by Newbury Trent. 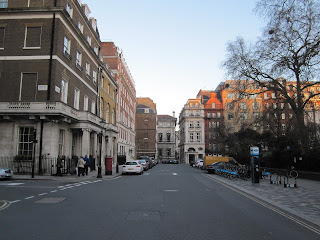 Just outside the frame, to the right, stands St James Square 1-2, on the corner of Charles II Street. This was originally a single house, built for Henry Benet, Earl of Arlington. The house soon passed to his brother John Benet, Baron Ossulston, and became known as Ossulston House. The original appearance was lost due to rebuilding in 1725-27 and the house was demolished in 1753. Two new houses were built in its place by builders Timbrell, Spencer and John Barlow. London and Westminster Bank bought number 1 in 1845 and number two after war damage in 1950. The two houses were subsequently demolished and a new building was constructed by architects Mewès and Davis for Westminster Bank in 1954-6. It survived less than 50 years and was demolished in 1996. The current post-modern building was constructed circa 2000 for Ericsson's London offices. It was sold to BP in 2001.